"I've sent my Christian Science article to the Cosmopolitan ... I shan't print the rest of the series till I issue a book." Christian Science with Notes Containing Corrections to Date is the final volume of the uniform editions of Mark Twain's works which were published in his lifetime. The book, written between 1898-1903, is a series of articles examining the Christian Science religion and its founder Mary Baker Eddy. Scholar Hamlin Hill best described the book as a mixture of "high satire and low burlesque." The 63,000-word volume consists of previously published magazine articles as well as new material. The book is divided into two "books." Book One consists of 9 chapters. Book Two consists of 15 chapters. There are also six appendixes, an additional essay titled "Mrs. Eddy in Error," and a conclusion. In October 1899 Cosmopolitan magazine published "Christian Science and the Book of Mrs. Eddy" which became the first four chapters of Book One. In 1900 when Harper and Brothers were compiling the collection of stories titled The Man That Corrupted Hadleyburg and Other Stories they had the opportunity to include the Cosmopolitan Christian Science material plus four additional chapters of new material. Harper declined to include the material in the American edition of The Man That Corrupted Hadleyburg. However, Chatto and Windus included Book One with 8 chapters in the British edition of The Man That Corrupted Hadleyburg as did Clemens's German publisher Bernard Tauchnitz. Harper waited until February 1907 to issue Christian Science with Notes Containing Corrections to Date. It was a time when Mary Baker Eddy and her followers had fallen out of favor in various newspapers and periodicals. The section identified as Book Two had never been previously published and was critical of Mary Baker Eddy herself. Harper issued the book in their uniform trade edition of red cloth and gold cornstalks as well as Volume 25 of the various uniform editions that had been initiated in 1899. The book publication of Christian Science with Notes Containing Corrections to Date, originally planned for 1903 but delayed until 1907, offered Clemens a chance to revise and refine the earlier magazine publications of his work. The most extensive study of the refinements Clemens made in his manuscripts was done by the editors of the Mark Twain Papers and published in the 1973 edition of What Is Man? And Other Philosophical Writings. The Works of Mark Twain edition edited by Paul Baender (University of California Press, 1973). Frank Bliss hired new illustrators for American Publishing Company's uniform editions begun in 1899. 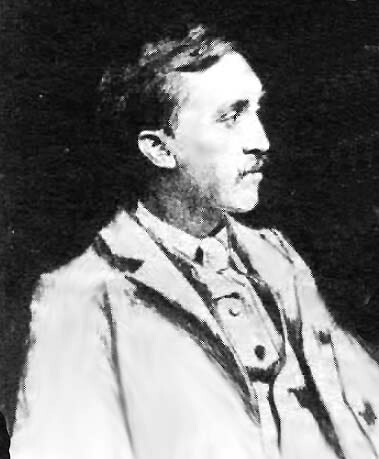 Artist and etcher William Harry Warren Bicknell (b. 1860 - d. 1947) was born in Boston, Massachusetts, the son of a grocer. Bicknell graduated from the Boston Latin School in 1878 and later studied at the Boston Museum of Fine Arts. He was a pupil of Otto Grundmann and Frederic Crowningshield. Bicknell's etching of the Tiffany monogram appears as a title page in every volume of the Autograph Edition, Edition De Luxe, Japan Edition, Author's De Luxe Edition, and the Royal Edition. Bicknell's engraved title page is present in Volume 25 of these editions but it is omitted from the illustration list. Thus, Bicknell's work is uncredited in Volume 25 for these editions. 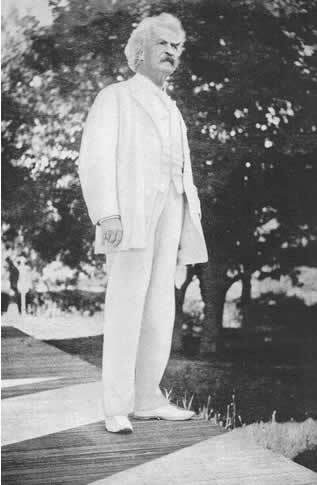 The frontispiece for all editions of Volume 25, Christian Science with Notes Containing Corrections to Date, is a photo of Clemens taken in 1906. This one says the pictures will inflame the reader. There is nothing in that argument. If a reader is so combustible, let him take out a fire policy. But there is no fear; it is not going to happen. When a reader understands a picture it does not inflame him. Very well, he will understand these pictures, because I shall explain them as I go along (Twain, p. 518). His most inflammatory illustration was one that featured Christian Science founder Mary Baker Eddy with a crown on her head holding aloft a book titled Science and Health in her right hand and a one dollar coin held high in her left. Climbing up from the ground on a ladder to her waistline is a tiny figure that Clemens labeled "Dowie" after controversial faith healer John Alexander Dowie. Evidently, Harper won the battle of the illustrations because none by Mark Twain were used in an assault on Mary Baker Eddy and the Christians Scientists. Christian Science with Notes Containing Corrections to Date, Volume 25, was the final volume issued for the uniform editions begun by Frank Bliss and American Publishing Company in 1899 and continued by Harper and Brothers. Harper continued to publish the Author's National Edition in 25 volumes until 1920 selling it via newspaper and magazine coupons. This subscription edition was eventually taken over by the publishing house of P. F. Collier and Son. Hill, Hamlin. "Afterword." Mark Twain, Christian Science. (Oxford University Press, 1996). _____. God's Fool. (Harper and Row, 1973). Twain, Mark. What Is Man? And Other Philosophical Writings. The Works of Mark Twain edition. Paul Baender, ed. (University of California Press, 1973).